Why? Because today it’s not enough to have a website. Marketing is all about engagement. WordPress-based websites are a great way to engage with customers, readers, and communities. For search engines, regular updates and fresh information need to be added. The good news is that using WordPress really is not that difficult. This way you can keep your site active and build as much content as you want over time. I have read through analyses comparing WordPress wit Shopify and with Squarespace, Weebly, Wix, and Tumblr. I have used each of them and like how easy they are to use. No, you don’t need a scrap of code with those sites; they are for absolute beginners. Versatility. There are just so many ways you can use a WordPress website, and so many plugins to help. Also, I like the look of Squarespace, but you can tell immediately if that’s what you’re using. The templates don’t offer much variety. WordPress isn’t just for small blogs and personal websites. Some of the most well-known brands in the world are using WordPress, including Facebook Newsroom. Even Wix uses WordPress for their tech support. So does The New Yorker, Star Wars, Microsoft News Center, Disney, Tech Crunch, and many others. Read more about them. WordPress is a free, open-source blog tool and publishing platform. It was built by hundreds of expert volunteers and is used by millions around the world including large corporations such as eBay, Yahoo, and Martha Stewart. WordPress can be used to create beautiful websites, blogs, almost anything. In terms of ease of use and usefulness, it’s not hard to see why WordPress is king for websites these days. A blog-enabled website will put you a level above your competitors who do not have sites or have only a static sites. No software costs. Free to install. Frequently updated content ranks well in search engines. It engages readers and builds a relationship. A website with lots of useful information positions you as an expert in your field. What’s the difference between WordPress and Joomla? Joomla, on the other hand, is a content management system. That’s not to say you can’t use Joomla for blogging, but its chief purpose is in using categories, articles, and menus to organise information. Modules are the building blocks for layout. There are also components and extensions which add richer functionality, including functionality for blogging. In terms of ease of use, WordPress is much easier to learn and to use, in the opinions of many. For a fast and easy way to look up a domain name, buy it, then link it to your hosting, I recommend Crazy Domains. Here I am referring to self-hosted websites only. That means you purchase the domain e.g. janesmithjazzercise.com and you pay to have the website hosted independently of a free service, such as wordpress.com. A WordPress hosted website may be free for hosting, but you will always have the domain janesmithjazzercise.wordpress.com to contend with. Crazy Domains is not only easy to do business with. They have one-click installations of WordPress through Fantastic because they use up-to-date cPanel software. Not all of them do this and require you to do a manual installation. You can also search right from their homepage whether your domain name is available without ever logging in or giving your details or payment information. They are my choice for their excellent technical support. I have 20 or more websites running today. They can be phoned, emailed or you can ‘live chat’ for help and any problems are usually solved immediately.That’s really important because if something does go wrong, and usually it’s my fault, you want to fix it right away. 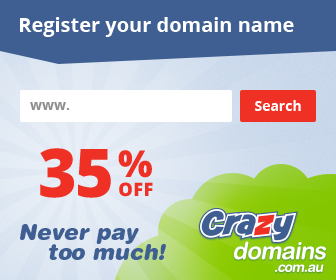 Prices from Crazy Domains are much cheaper than others I have used in the past. I have used half a dozen different domain registrars and website hosts. It is so much easier if you choose the one company to get both. The prices are often wildly exorbitant which I have never understood. Why would I pay $80 or more for a domain when I can get one for two years for $24. It’s a commodity intangible item. You own it or you don’t. Surely there is no additional value from the more expensive domain is offering. A Crazy Domains website promises to be hosted on servers around the world. That means you should get a server that is close to where your customers are. Why is that important? If you’re an Aussie business, there is no point using a dirt cheap web host if the data has to travel across the Atlantic and then down the Pacific if it affects page load speed. The diffusion of WordPress around the world has made it de riguere to provide one-click installations for users. You can see from the prevalence of promotional messages used by web hosts how much they realise WordPress is here to stay! When I built my first WordPress website in 2008, I spend many nights after work tearing my hair out. It took about three weeks to finish and then a couple of months to get everything to do and look the way I wanted it to. The longer I’ve been using WordPress, the easier it gets. If you’re not on it yet, it’s never too late to try something new and discover you love it. And if you any help, let me know. This entry was posted in Social Media, WordPress and tagged content is king, customer engagement, web design, wordpress by Danielle Spinks. Bookmark the permalink.